As you may already know, I spent part of the weekend making cards. While I was making the 24 cards, I realized that I really wanted to sell some of the cards in packs of 5 or 10 on Etsy – not packs of four. So that left me with four extra cards. Four extra cards that I thought would be kind of perfect for a giveaway on my little old blog. So here you go. A giveaway. 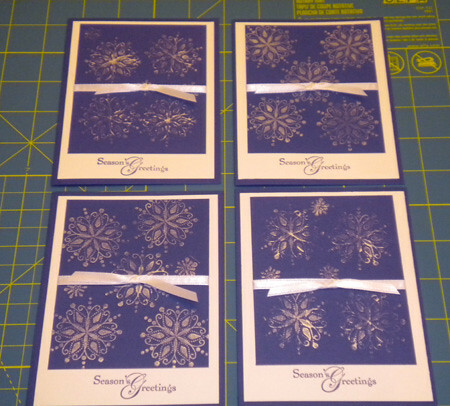 It’s a pack of four cards (and white envelopes, so you can give them away.) They’re hand-stamped by yours truly. They may not be perfect, but I still love them. We actually sent these cards out to most of our family and friends last year. I won’t even go into the time we spent on those. May the true spirit of Christmas fill your heart with peace, your home with love. We’re going to close this out on Sunday at noon EST. I’ll announce a winner Sunday evening. Cute cards, you’re so crafty! I wish I was more crafty. I’d blame it on the kids, but I wasn’t crafty before them either. Cute cards Jaime! And very cool you are on Etsy! !